Corals have always captivated my attention, in particular the concept of coral restoration and growing my own underwater garden. The more I studied these alluring animals I started experiencing dive sites with new eyes, and my perception of the underwater landscape started to grow. Scuba divers can often identify that coral reefs are lush, underwater habitats full of color and life, but often knowledge of coral diversity stops there. There are over 800 species of hard coral, and each one is unique. There are two main types of coral. Hard coral and soft coral. As the name implies hard corals build a hard calcium carbonate skeleton, and soft corals are soft and flexible lacking a hard skeleton. All corals, however, are made of animals called polyps. So what is a coral anyways? Corals are colonial animals. They are made up of hundreds of tiny animals called polyps which bud and divide asexually into identical clones. As the polyp multiply, colonies can grow to impressive sizes. Depending on the species, colonies can be several meters across with well over a thousand polyps. 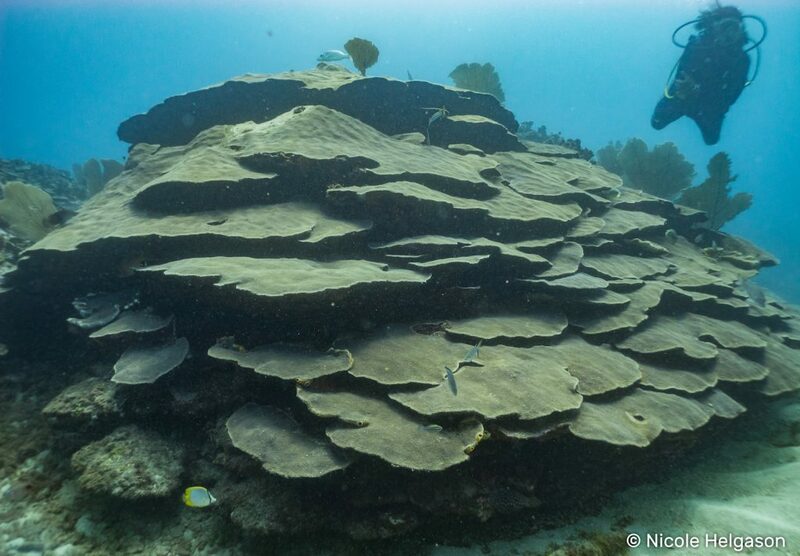 This Boulder Star Coral (Orbicella faveolata) in Tela, Honduras is estimated to be over 500 years old. That means it was living in the bay before Christopher Columbus arrived in the new world! 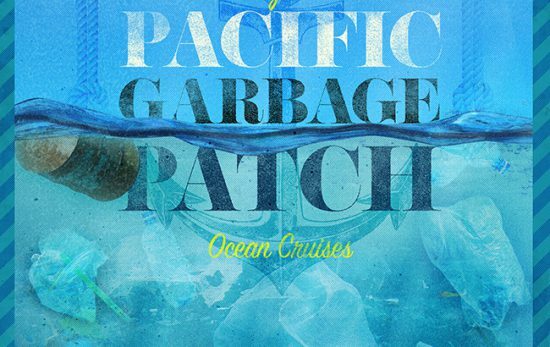 There are thousands of individual polyps which make up this gigantic colony. But not are corals are colonial and solitary polyps species. Scolymia, Acanthophyllia, and Heliofungia are some of the most interesting, colorful and obscure corals you will find on the reef. The largest species of Scolymia in the Caribbean can reach 6 in (15cm) in diameter, and Heliofungia from the Indo-Pacific top out at 8in (20cm). 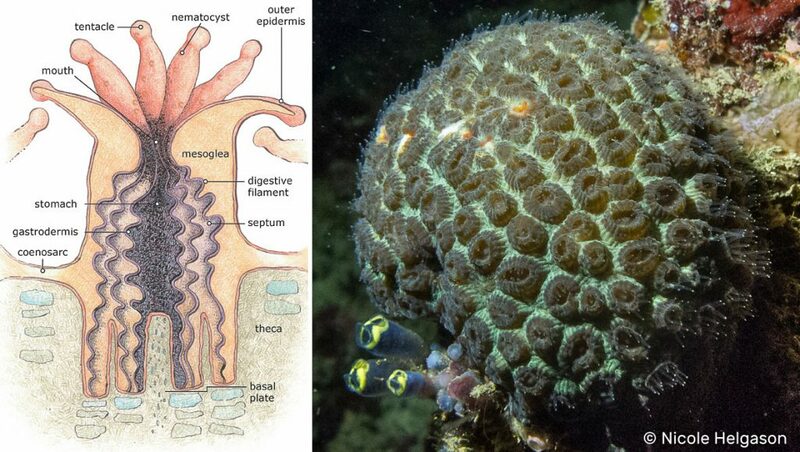 Coral polyps look like sea anemones and have the same internal body structure. The coral polyp has a crown of tentacles, a mouth, and a stomach. Any waste the polyp produces will exit through its mouth. During the day, coral polyps are often closed, depending on the species. At night, however, most coral polyps will expose their tentacles, waiting for a passing meal. 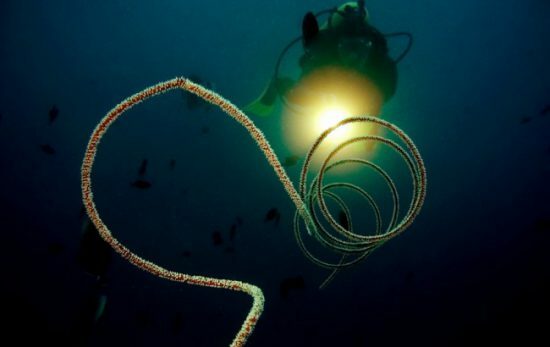 If you’ve ever done a night dive, you would have noticed the corals look more alive, with large active tentacles. Corals polyps look like tiny sea anemones, and thousands of polyps can make up coral colony. 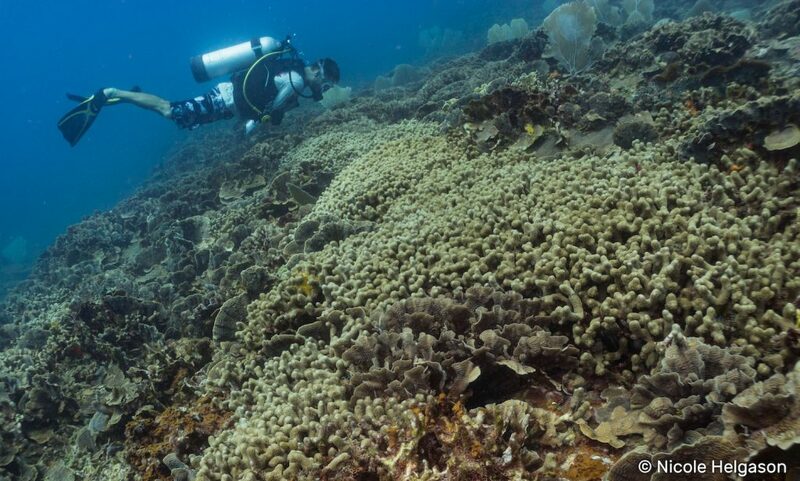 Corals live in a symbiotic relationship with the photosynthetic marine algae called zooxanthellae. In exchange for protection inside the coral tissue, the algae produce energy through photosynthesis which the coral used to build its skeleton. When the water temperature is too hot and corals bleach, it is caused by them losing these symbiotic algae. Their tissue becomes translucent (zooxanthellae is greenish brown) and all you see is the ghostly white skeleton below the empty tissue. Once this happens the coral can die. Coral reefs are made up of different species of coral which together we call the reef. Once you have an idea of what to look out for, diving on a coral reef becomes a vast scavenger hunt for hidden gems. Some corals are more common or more abundant while other smaller cryptic species are hiding in caves or encrusting below larger colonies. My favorite pastime underwater is photographing and identifying corals. Unlike fish, corals of the same species can look different. This is dependent on the depth you find the coral, how much light is reaching the coral, if the coral is in the current or in a low flow environment. This diversity even within a single species is what keeps me excited about looking for corals. You never know how the next colony will look, or what beautiful arrangement neighboring corals will create. It’s good to know a little bit of science when trying to identify corals. Corals are divided into genus and species. It is easier to identify a coral to the genus level rather than species level. For example Acropora, is a genus. There are three species of Acropora in the Caribbean and nearly one hundred and fifty species of Acropora worldwide. It’s much easier to learn to identify the genus Acropora before trying to distinguish each species. When learning coral identification it’s important to know that corals are regional animals and where you are diving will determine which coral species you will find. When you are trying to identify any coral, note the region you are in to narrow down a possible species. Corals are important animals that deserve more attention and appreciation. Learning to identify coral will enrich your diving experience both for novice and experienced divers. Next time you head out to the reef, try to identify a few corals and notice how different and diverse each species can be. 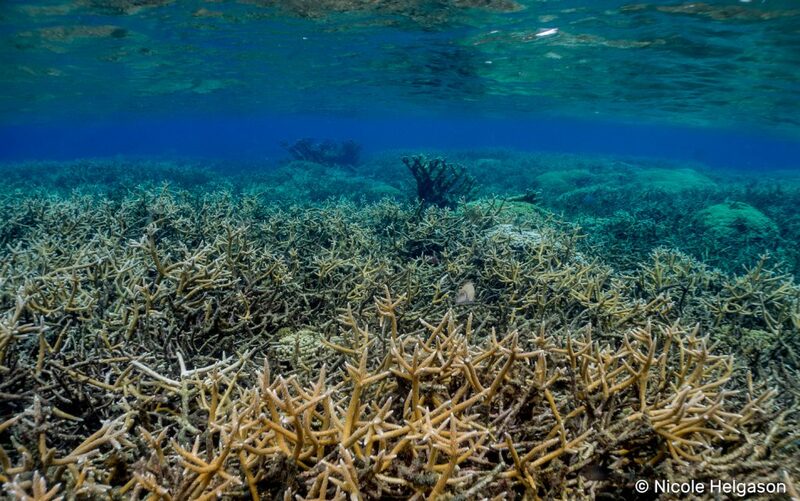 Learn more about how ocean acidification threatens coral reefs. 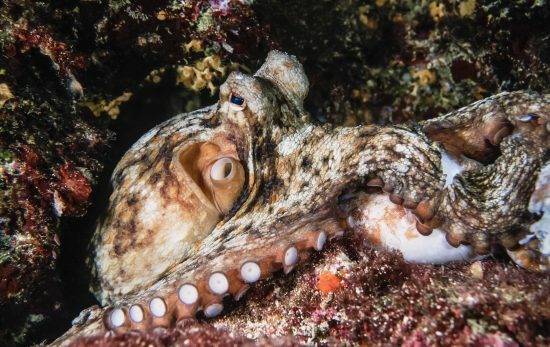 An Octopus’s Garden – More than just a Song!